In concluding the series on the reiteration of infrastructure in Warwick, it is worth looking at broader structures that have allowed for and initiated reinvestment and renewed interest in infrastructure for informal workers. Over the past months blog posts have covered the progress of new infrastructure for recyclers, the reopening of the bead market, the challenges the mealie (corn-on-the-cob) cooks have faced in their infrastructure and the participatory processes that the bovine head cooks underwent in the design of their future space. It is also hoped that there will soon be investment into the lime and impepho market. These infrastructure investments are all of significance as they give recognition to the needs of informal workers. Whilst most of the urban renewal work done in Warwick happened in the late 90s and early 2000s, very little investment has occurred since then, and it has only been in the last 3 years that local government has recommitted interest and infrastructure funds to the area. Proposed shelters for the Lime and Impepho Market. Drawing by Asiye eTafuleni. On the 24th of October local councilors, accompanied by the Business Support Unit and members of the eThekwini Municipality Informal Economy Forum, went on an inspection of Warwick Junction to assess the infrastructure needs and find out what challenges informal workers are facing. 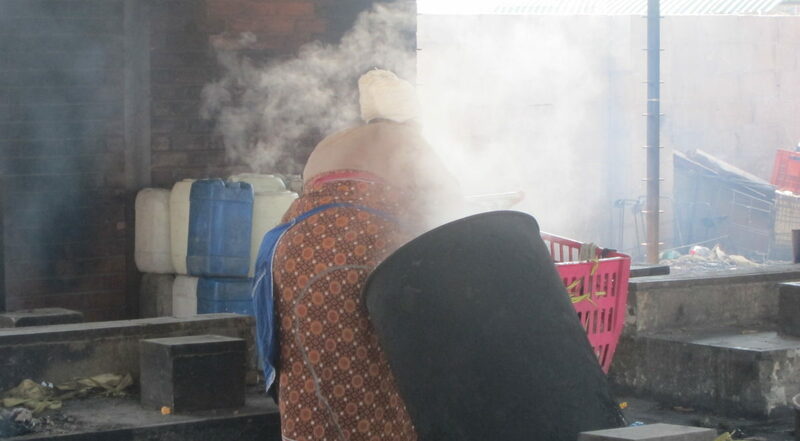 The mealie cooking facility and bovine head cooking facility were visited. 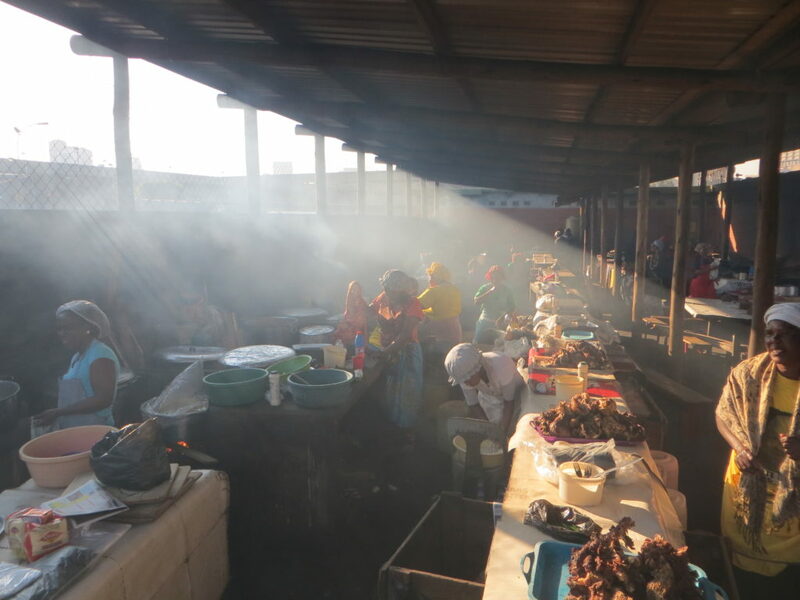 It is notable that inspections of this nature are occurring, as they mark the significance of political oversight which could reinforce reinvestment and renewed interest in the needs of informal workers in Warwick. Bovine head cooks in the temporary facility that was visited on the walkabout. Photo: Asiye eTafuleni. The process initiated a commitment for follow up meetings to allow workers the opportunity to further express their needs- and the local councilors have agreed to this. It was apparent that the informal workers were both eager to engage with the politicians and they were opinionated. This indicates that there is prospect for constructive engagement that could create reciprocity between political oversight in a city and citizens. In light of the state of service delivery in South Africa local government taking oversight of an aspect of service delivery such as infrastructure provision is encouraging. Asiye eTafuleni feels that a successful outcome of these engagements would be that the political interest and oversight would be sustained in the future. Further, it is hoped that the ensuing engagements are able to assimilate trader critique, stimulating better processes of more direct engagement between informal workers and politicians; this could be beneficial for the sector as a whole, not just in terms of infrastructure. In addition the service provided by the Business Support Unit could be strengthened.